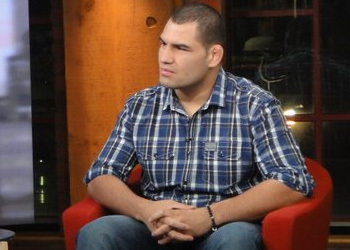 UFC heavyweight king Cain Velasquez will be facing a friendly firing squad today inside the MGM Grand Garden Arena in Las Vegas, Nevada. The first Mexican-American heavyweight champion in any combat sport will be the special guest speaker for UFC 125‘s Fight Club Q&A. In somewhat of a shocking upset, Velasquez dominated Brock Lesnar at UFC 121 this past October to capture the title. The former WWE superstar was a 2-to-1 favorite to retain his strap. Following the win, the American Kickboxing Academy trained fighter went on a media tour to share the secrets of his success. The humble heavyweight appeared on ‘Lopez Tonight’ with George Lopez, as well as visits with ESPN and several national radio appearances. It was confirmed Wednesday by MMAFighting Velasquez could be out six to eight months from a torn rotator cuff. He initially injured his shoulder during his 1stRound destruction of Lesnar. UFC play-by-play man Mike Goldberg will host today’s festivities, which begin at 12PM PT/3PM ET.